Kirklees funeral director Richard Howard Fearnley J.P. has been named one of the UK's best funeral directors following an assessment visit by the Good Funeral Guide, an independent funeral consumer advocacy organisation. "The scale of his business enables Richard to offer you all the personal service you need plus very competitive fees. He loves his work and he's very good at it. He is kind, compassionate -- a thoroughly nice, sincere man; very much 'one of us'." 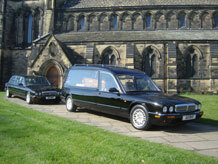 "Richard will enable you to have a high-value funeral. He's a careful listener, he'll never hurry you. The quality of personal service here is outstanding." The Good Funeral Guide assesses select funeral homes according to strict criteria which focus on the quality of the experience they offer to bereaved people. Richard Fearnley Independent Family Funeral Directors has been inspected to ensure that clients are treated with courtesy, listened to with empathy, offered a full range of choice, charged fairly and empowered to play whatever part they want in creating a send-off for the person they have lost which accords with their values and wishes. The accreditation process also involved spending time behind the scenes in order to ascertain that those who have died are cared for with the utmost tenderness and respect. 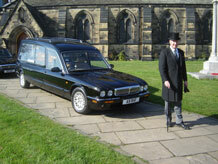 "Choosing a funeral director can be very difficult because they all look much the same. But they're not. Some, a precious few, are truly outstanding, and Richard Fearnley is one of them." "The team at Richard Fearnley's are unsung heroes doing a magnificent job, and the people of Kirklees deserve to know this. Bereaved people need to do their very best for their loved one. They deserve the very best funeral director." 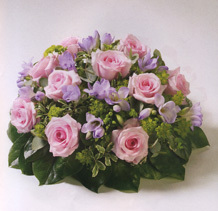 "We are extremely proud and honoured to be recommended by the Good Funeral Guide." 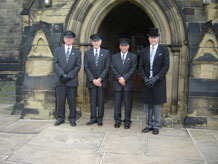 The Good Funeral Guide is wholly independent of the funeral industry. It offers information and guidance to the bereaved and supports, empowers and represents the interests of dying and bereaved people living in the UK. 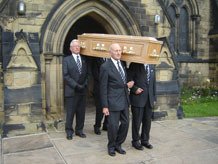 The Good Funeral Guide is a not-for-profit social enterprise company - Community Interest Company number 7818343.